It’s unclear why we thought stenciling a message on the side of a highway was an appropriate way of saying farewell. Before Emily launched to great fanfare back in June, we were scared. How would people react to the suggestion of talking to a Facebook Messenger chatbot about one of the last remaining taboos in our communities: Death? We needn’t have worried. Or, at least, there was no need to worry about whether or not people were willing to embrace a chatbot. The feedback we had from our customers was overwhelmingly positive. The wider industry of palliative care, hospice care, and others operating in the end-of-life space were also effusive with their commendations. 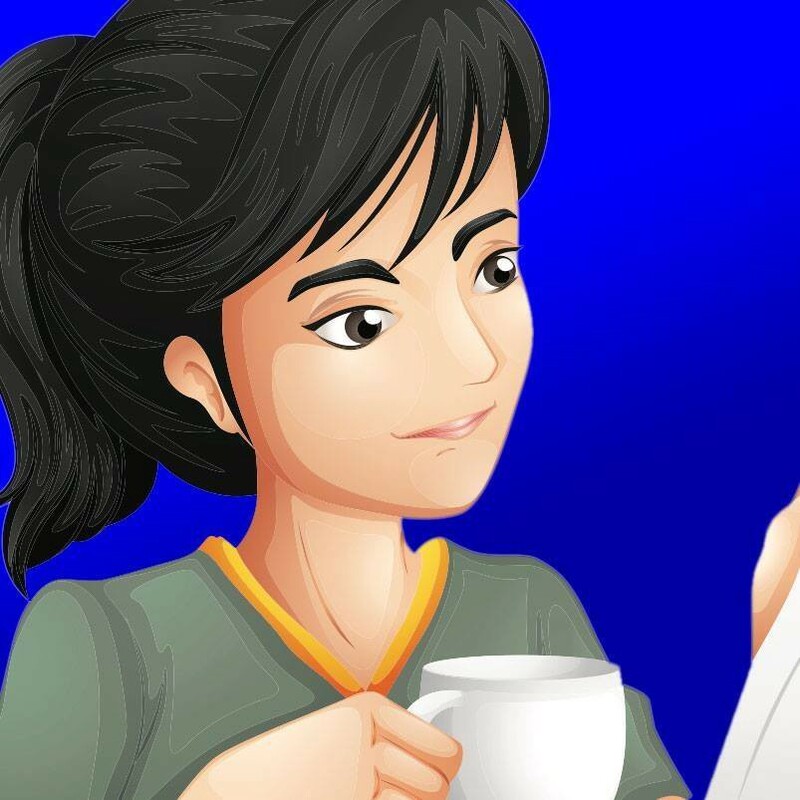 Our chatbot Emily. She’s awesome. She’s now had hundreds of conversations. While chatbots don’t really get tired, we do feel that she deserves a break. We picked some big and important fights: Against the mysterious language of ‘legalese’ and the needless over-complication of language used in end-of-care planning. In fact, most of our writings throughout this project were at a 5th grade reading level, because we believe that’s important. 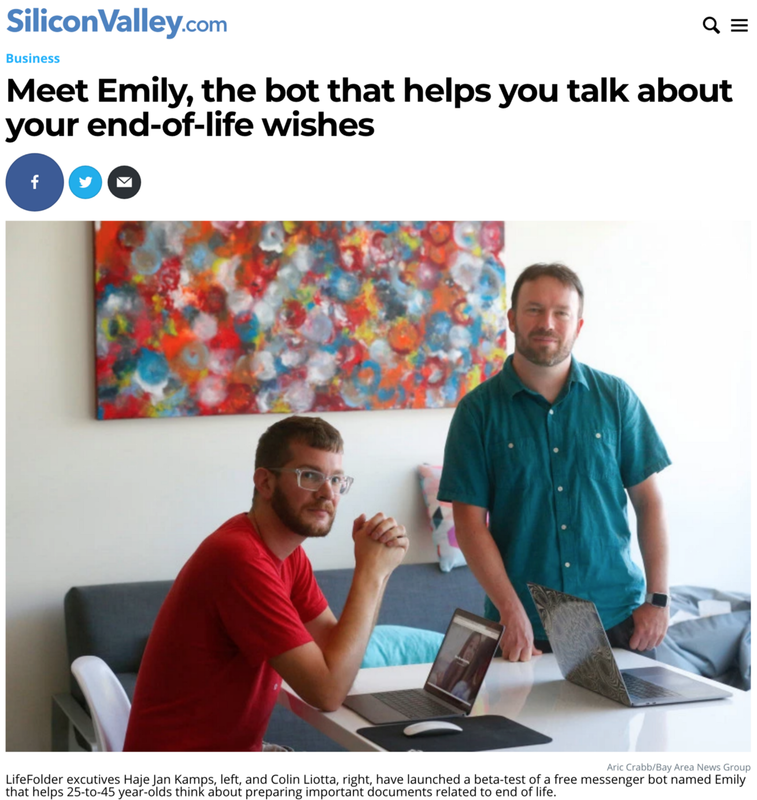 Through our chatbot Emily, we invited people to have their very first conversation about end-of-life. We turned the information shared with Emily into legal documentation and a personalized end-of-life discussion guide. And throughout, we ensured that people were prepared to talk with their loved ones about end-of-life decisions. We believe that Emily is one of the best tools to introduce people to the concept of conversing about death. But as any experienced businessperson will tell you: It doesn’t help to have the best solution in the world if the problem isn’t one that people are prepared to solve. And that, ultimately, became our undoing. Lots of smoke, not enough fire. We had some incredible press, including television appearances on Sacramento ABC10 and the BBC. We were covered in Men’s Health, Cnet, Motherboard, VentureBeat, LifeHacker, the East Bay Times, Mercury News, the Ledger-Enquirer, the Daily Democrat, Kampfire, and BotCube. We even had some international coverage, in Brazil’s Tecmundo, and the Dutch Customer First blog. We were semi-finalists in the annual AARP Innovation Champion awards, and were invited to speak at a number of health- and startup-related events. In short: We made a lot of noise. It doesn’t help to have the best solution in the world if the problem isn’t one that people are prepared to solve. Throughout, however, we continued to be worried that the press and publicity din wasn’t really having the intended effect. Yes; hundreds of thousands of people were finding out about LifeFolder and Emily. They were reminded that planning for end-of-life is crucial. But ultimately, press coverage isn’t really a metric that matters all that much to businesses. To LifeFolder, the most important metric was whether people were starting — and finishing — conversations. And there, we fell short. As it turned out, more than 1,500 people spoke to Emily, and more than 31% of those people completed the 45-minute conversation. One of those numbers is incredibly encouraging. Not in our wildest dreams had we dared hope for the level of engagement we were seeing. 30% completion for a product like ours is completely off the charts. The other number, however, was a real problem: 1,500 people isn’t enough to light the fire of engagement we needed in order to really make a dent in the world. In the world of startups, you need ‘traction’ in order to show that what you are doing is working. Traction can mean a lot of things, but revenue or strong user growth are the two main ways you show progress. Given that our product was free (the idea was to monetize it later by offering additional services), that leaves growth. We did see a huge spike of conversations early on — largely due to the LifeHacker article — but we have struggled to find a way into people’s minds and hearts since. Which puts us in a complicated position. To date, Colin and I had been funding the company ourselves. We’ve not been taking any wages along the way. That is okay — it is how things are done in startup land. While we were able to keep costs down on many things, there was one unavoidable cost: Lawyers. LifeFolder’s product has a very real effect on life-and-death situations, which means that the legal side of the business had to be iron-clad. We solved that problem by hiring the best lawyers in the business, but that obviously comes with a hefty price-tag. Once we launched our product in June, we started work on trying to raise additional funds, and that’s where we failed. I think if we had seen explosive growth in the user numbers, and a successful ‘viral’ strategy (i.e. that every user invites other users to also complete their end-of-life plan), I wouldn’t have been writing this article right now. Unfortunately, that didn’t happen. The feedback from the (many) investors we spoke to was helpful, but boiled down to that we didn’t have the numbers to back up our idea. There was general agreement that the problem end-of-life planning was worth solving, but that they didn’t have faith in our business model. Change the business model, re-tool the company, and start showing revenue coming in. Change the go-to-market strategy, figure out ways of getting huge numbers of people to start talking to Emily. We looked at all the options in great detail and at great length. Without numbers on our side, we weren’t able to carve out a path to profitability. We weren’t able to make the ‘viral’ side of the equation work. And, in the cold, hard light of day, we didn’t see a path to getting there anytime soon. Around the same time, we received another blow. Our chatbot Emily was built on Pullstring’s Author platform for creating conversational interfaces. 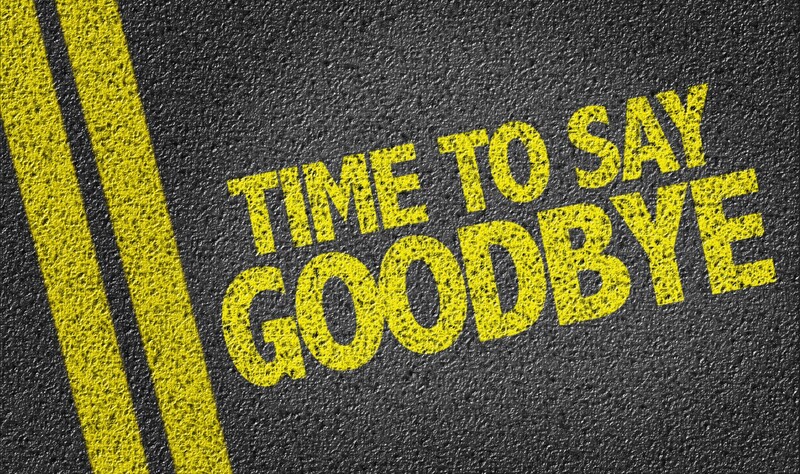 It was a fantastic tool, but in September, the company announced that they were closing down the service. That left us in a pickle. The technology we had built the company on was disappearing from underneath us, and as per December 1st, Pullstring was no longer supporting it. The upshot was that we would have to to re-write our entire conversational engine on a different platform, or potentially code our own from scratch. That would have been possible, of course — we do have an incredible technical team. However, it meant that we wouldn’t have any time to try to solve the underlying problems with what we were doing. Even if we had re-created Emily on another platform, we still hadn’t cracked the much harder problem: how to get people to have conversations about end-of-life. End-of-life is an incredible space to be in. Never have we met people as welcoming, friendly, and eager to help. More importantly: In the US alone, there’re 150m people who still need to plan for end-of-life. It’s a huge, unsolved problem, and there will be some real technology innovation in this space before long. Unfortunately, we weren’t able to build a sustainable company around our solution, which is why we today announce that we’re going to close down the company. If you were a customer, you will receive an email from us that includes your end-of-life document and discussion guide.